The oil tanker Athlos caught fire off the Larnaca coast at around 9.30am on Saturday, injuring two crew members who were rushed to Nicosia general hospital suffering from serious burns. Three other members of the total crew of 17 were transferred to the Limassol general hospital for check-ups. The five had fallen into the sea after an explosion on board caused a fire. They were rescued by members of the Joint Rescue Coordination Centre (JRCC) in Larnaca before being transferred to state hospitals. “From the five that were rescued, two are seriously injured with burns of 30 per cent and 70 per cent respectively… while the other three were diagnosed with hypothermia symptoms and have already been discharged from the Limassol hospital,” said lieutenant commander of the Cyprus navy, Andreas Charalambides. The two crew members seriously injured were Indian nationals. The other three were Greek nationals. 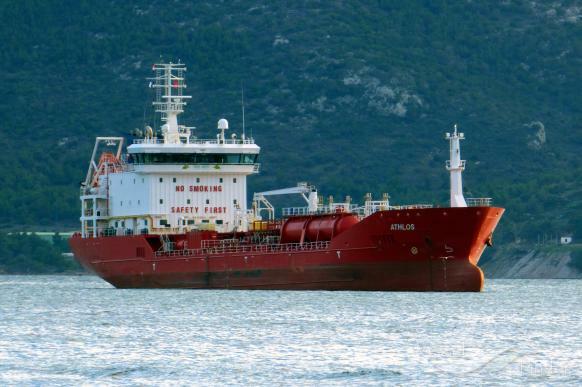 ‘Athlos’, a vessel registered under the Malta flag, was anchored one nautical mile off the Zygi fishing shelter, close to Maroni village in the Larnaca district, and 200 metres from the coast. “The vessel had departed on Saturday morning at around 3.30am from the Larnaca port sailing for Aspropyrgos [in Greece],” Charalambides said. Members of the fire service along with port police rushed to the scene, though the fire had already been doused by the crew members. The JRCC said that coordinating the rescue was part of the national rescue scheme ‘Nearchos’, which saw the deployment of port and marine police, the Cyprus navy, the catastrophe response special unit, towing vessels, as well as other ships with the aim of rescuing crew members and dousing flames. “A helicopter of the Cyprus police aviation unit was also deployed to provide imagery in case of an oil leak in the sea,” Charalambides said. Argyrou added that the fisheries department has nevertheless taken preventative measures in view of a potential oil leak by placing a protective barrier around the ship. Department staff have also been stationed on the scene which is under constant monitoring, she said. For safety reasons, Charalambides said, the 12 crew members who were uninjured in the incident will remain on board while the rescue mission is being completed and ‘Orpheas’ is being activated. The ship will remain in place until the marine accident investigation committee determines the cause of the explosion and fire, and whether it is safe for the ship to be moved, he added.